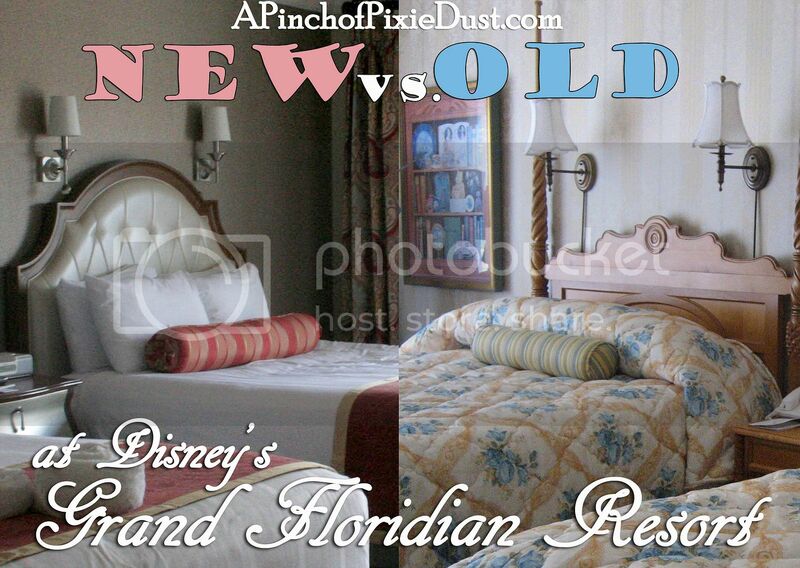 The Grand Floridian Resort and Spa - Walt Disney World's flagship resort hotel - recently got some renovation pixie dust with a big room redesign. 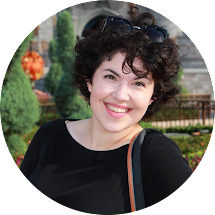 I was excited to take in all the new decor and details on our recent trip, and today I've got a tour for you! 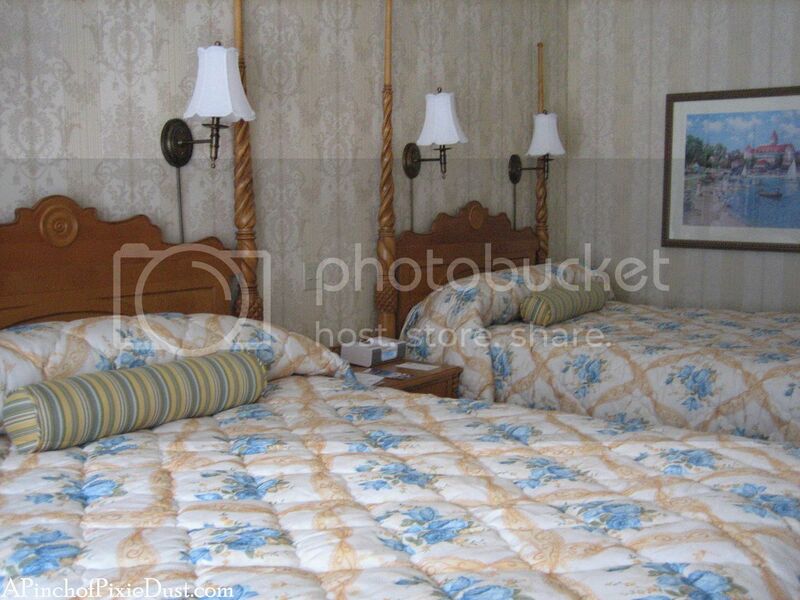 I did a comparison post when the Polynesian Village rooms got a face lift, and I thought it'd be fun to see the new room and remember the old room for the Grand's makeover too - with plenty of photos from past and present! So are you ready to check in and LIVE GRAND?? 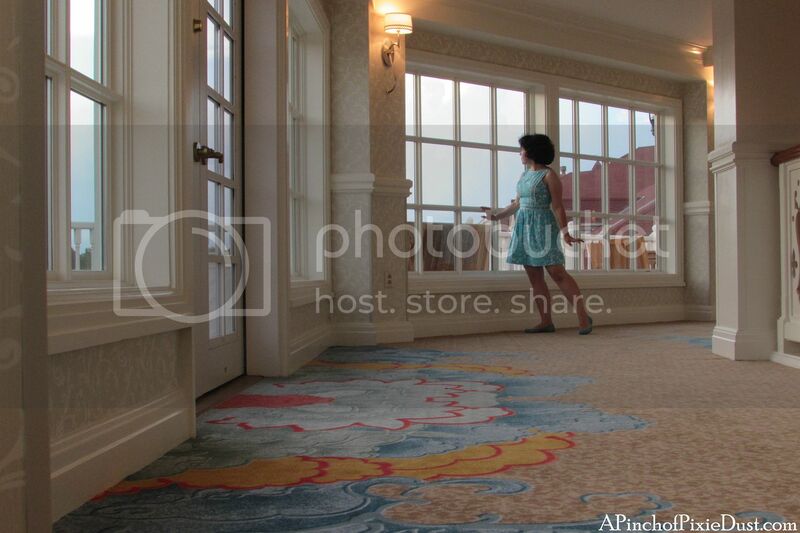 The carpets and wallpaper in the hallways are new as well! 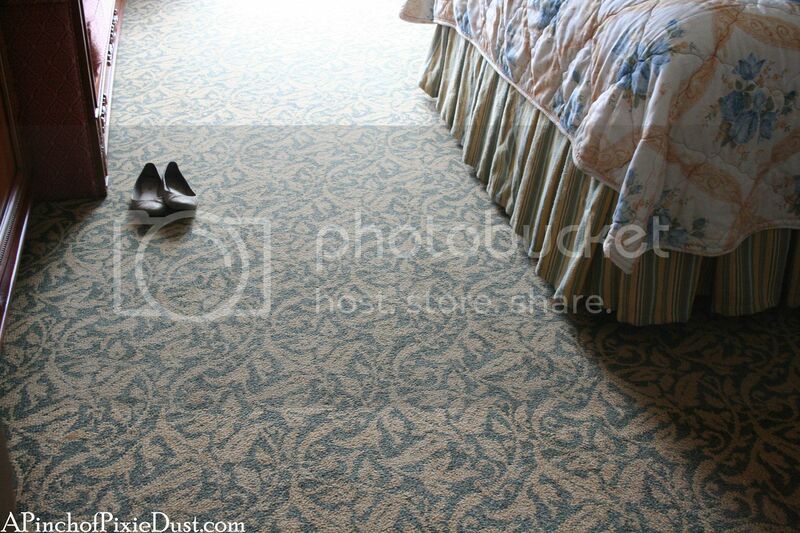 Check out the bright pops and curls and billows of color on the floor. I feel like Mulan would approve! 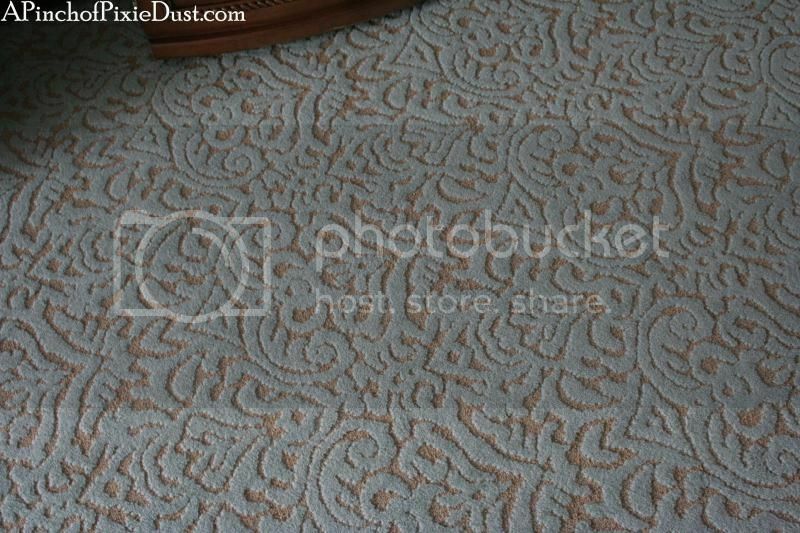 It reminds me a bit of the carpet color palette at the Grand Floridian Villas. 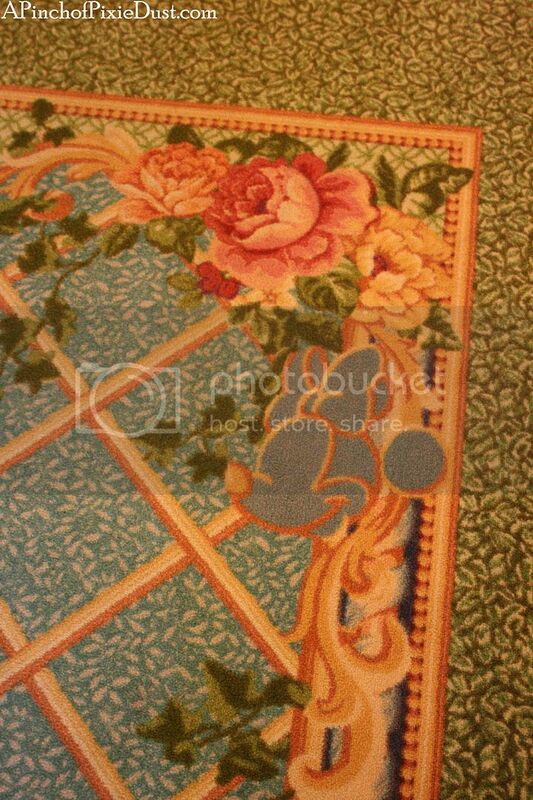 I do really enjoy the new carpet design; but I'm also very sad to say goodbye to Minnie Mouse and her roses. 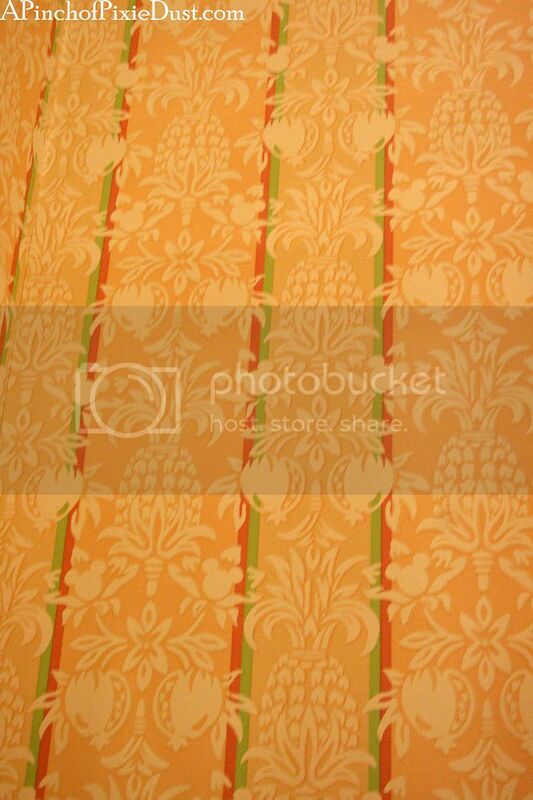 I think I prefer the old colorful wallpaper with the exotic fruits and hidden mickeys to the new generic beige swirls. 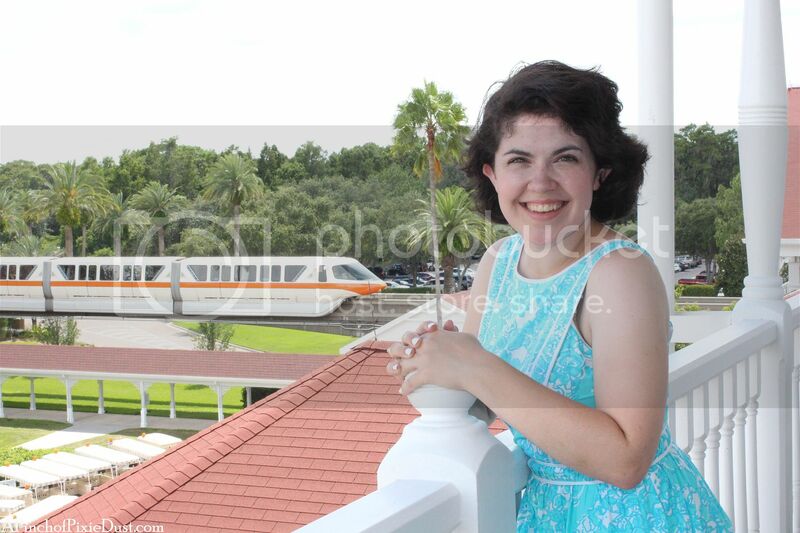 Change, however, is an inevitable part of life...and Disney World decor. ;) Are you ready to see the room? 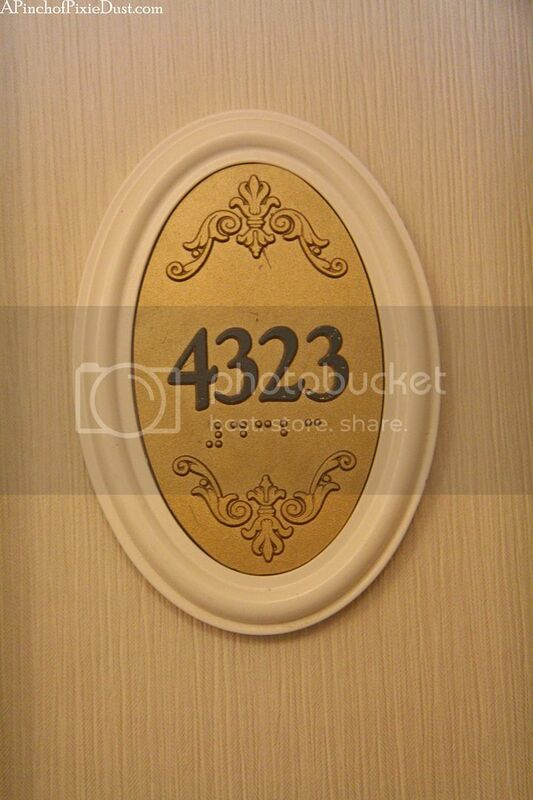 We stayed in room 4323 on the third floor of the main building. 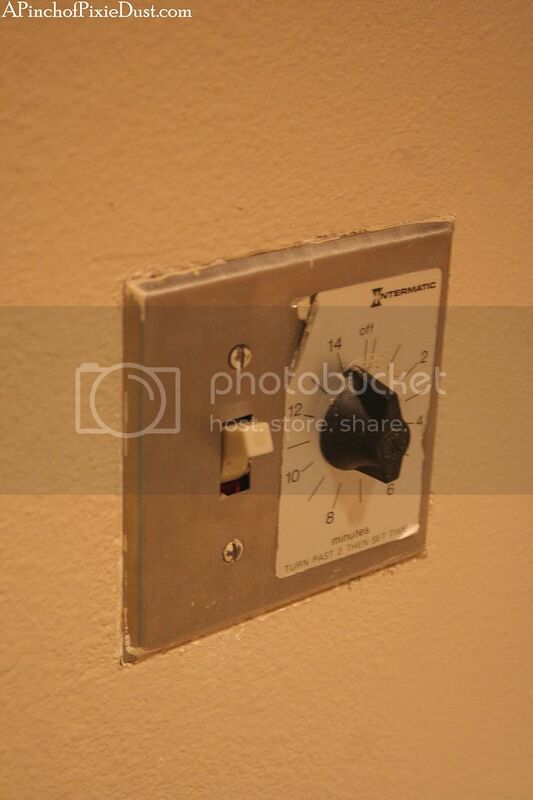 This is in the standard room category but due to the corner of the building it's located in, the room layout is slightly different from the rest. 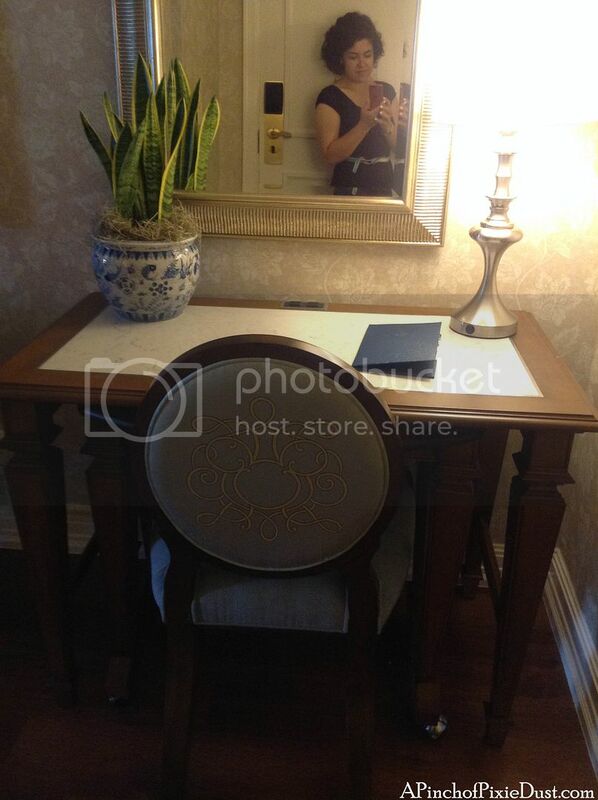 You enter into a small foyer with the desk in front of you. 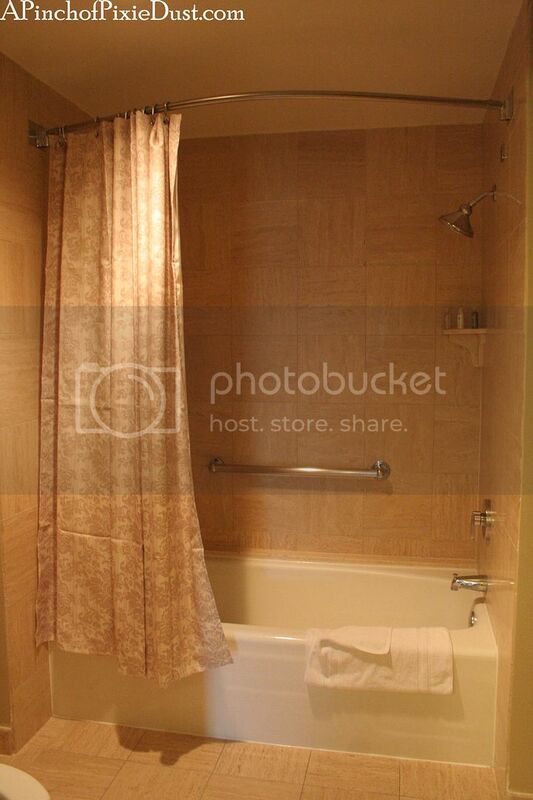 To your right is the bathroom, and to your left is the main bedroom area. 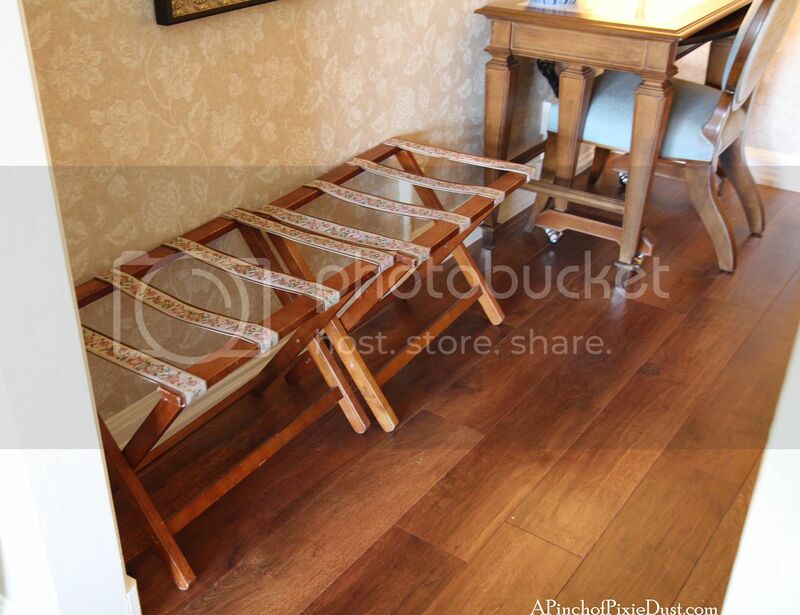 Another shot of the foyer with floral ribbon luggage racks. 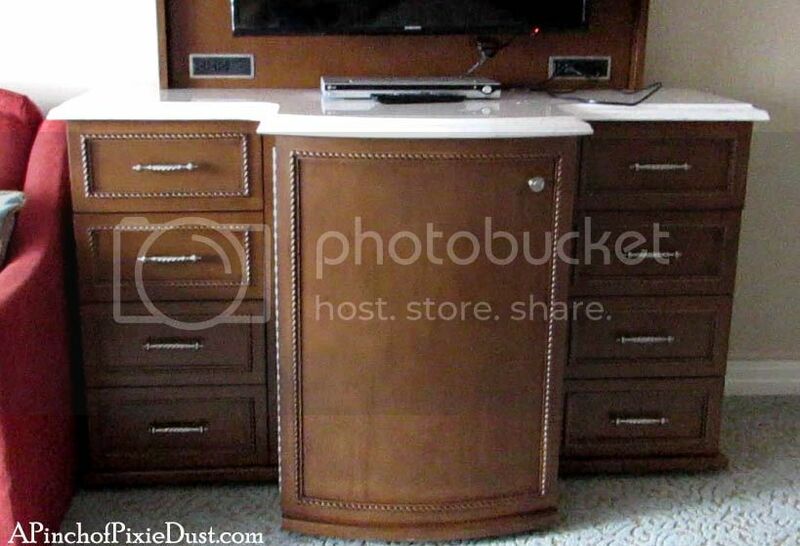 Opposite those racks is the closet which has mirror panels and white trim. 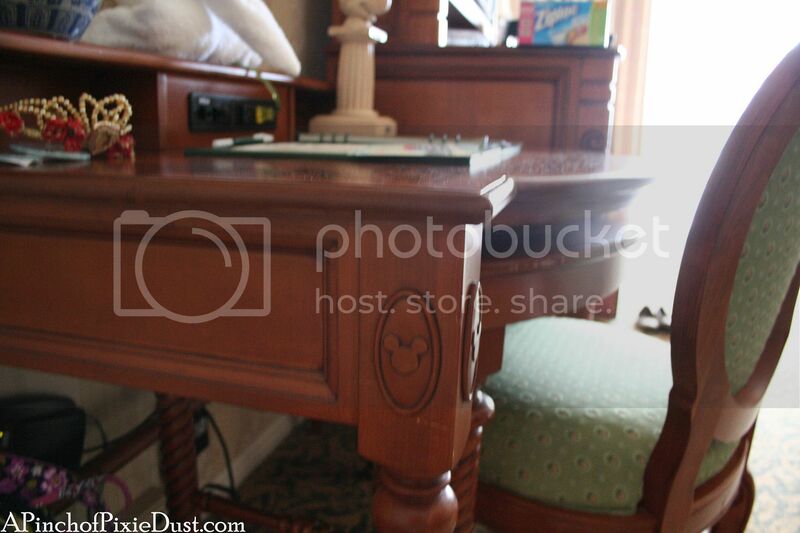 The wood flooring is very nice, and I absolutely loved sitting at that desk with its Mickey chair. I could just hear the band playing through the door as I sat catching up on my diary! Not the best photo, but can you spot her? 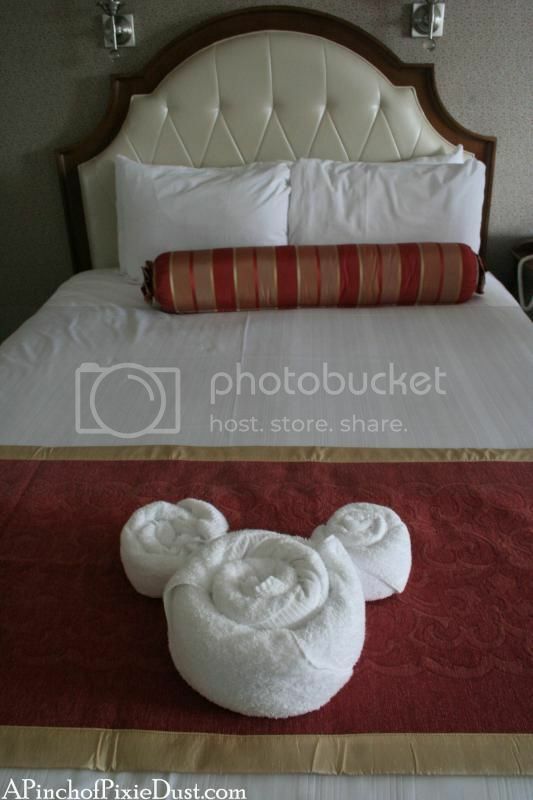 The new look is very elegant in its own very different way...and there are still towel mickeys! Old room on the left, new room on the right! 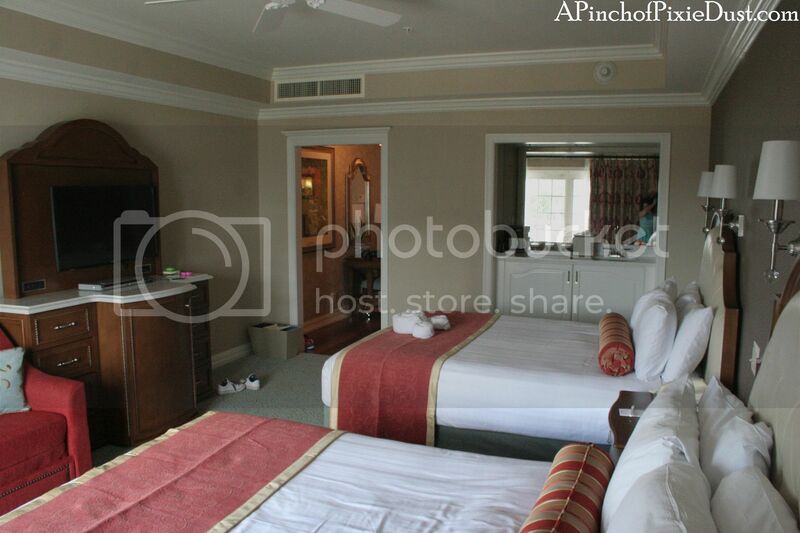 The room layouts are slightly different (you can see the desk next to the dresser in the pic on the left, whereas on the right it's down the hallway), but you can still get an idea of the new design feel. 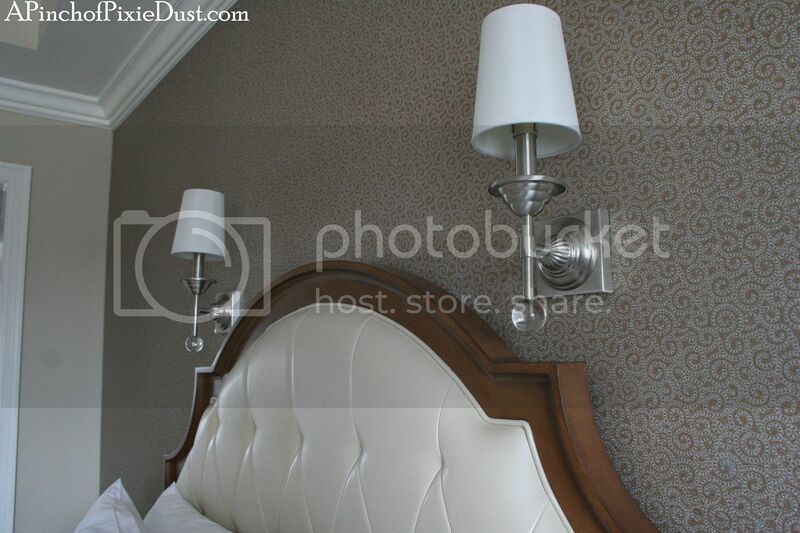 Past headboard, present headboard. 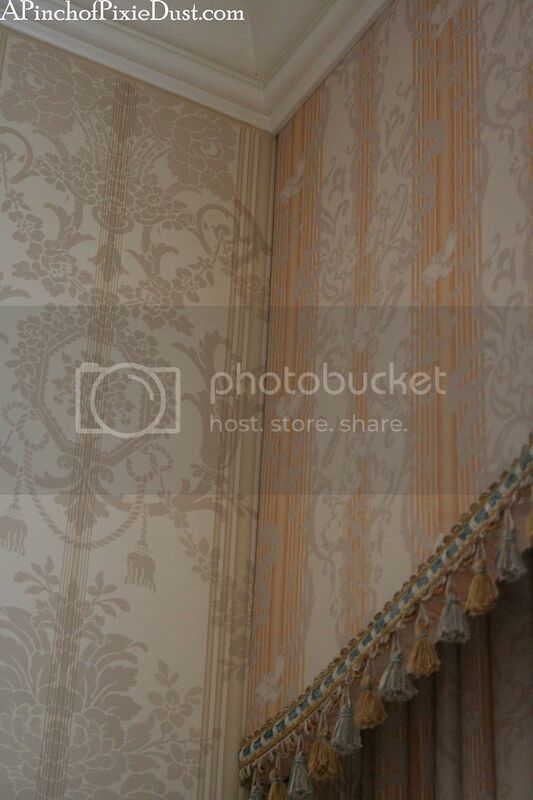 Also note the wallpaper change - just one wall of the new room is covered in that swirly paper; the other walls are painted beige. 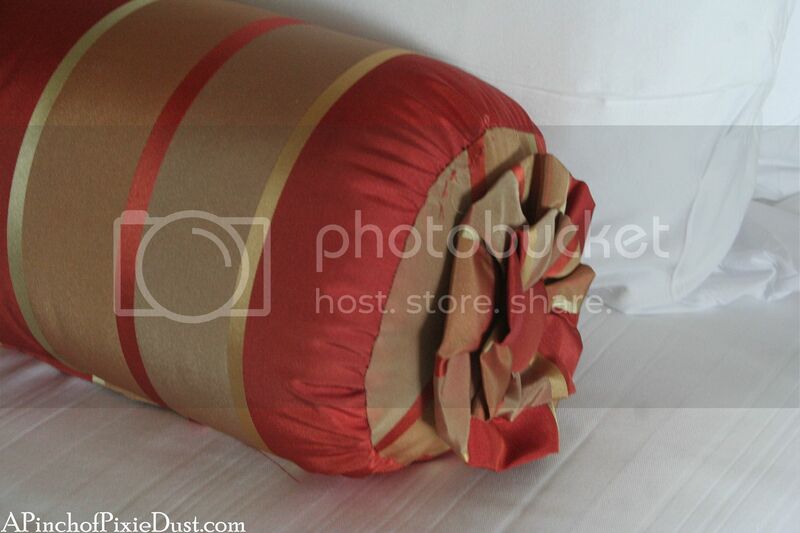 Ruffly details on the new rust-colored bed pillows. 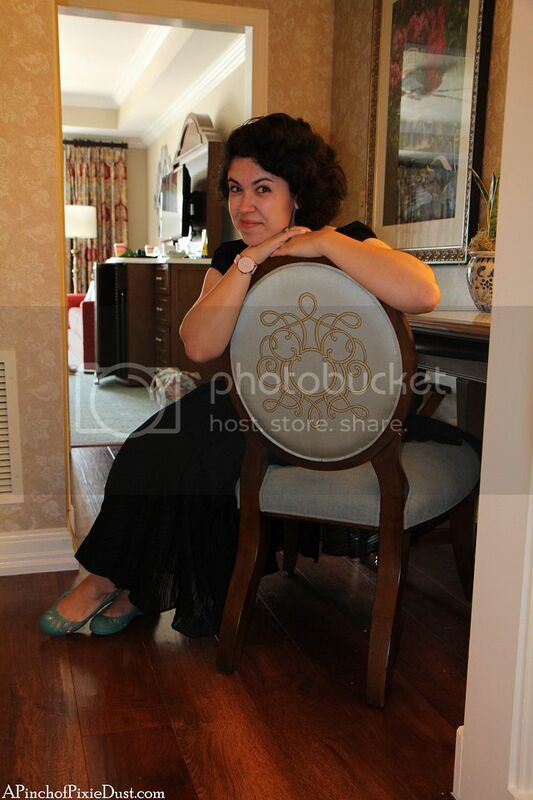 The old room had a very springtime-inspired color scheme. The new space is full of more dramatic, autumnal shades. Our room from this trip had a handy sink area tucked in the corner (again, not part of the design change but just because of the unique layout of this particular room). At first glance my mom thought this mirror was dirty - my brothers and I joked someone had been shooting a BB gun at it - but it is supposed to look like that. 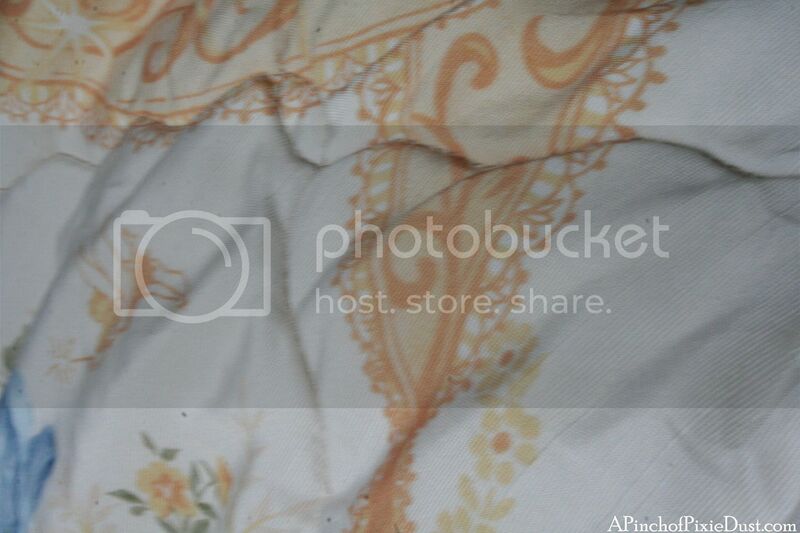 Very artsy...kinda like an instagram filter for your life instead of just your iPhone? 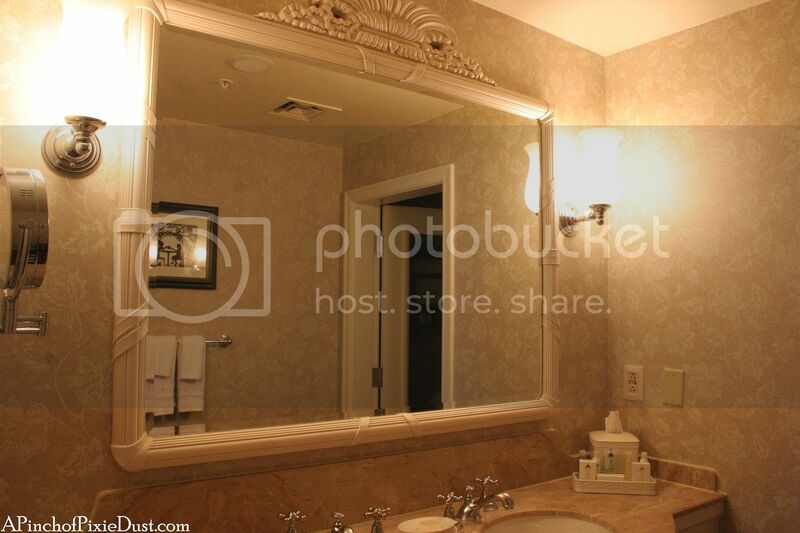 The mirrors in the elevators over at the Grand Villas apparently look the same. Also note the angular tray and ice bucket. 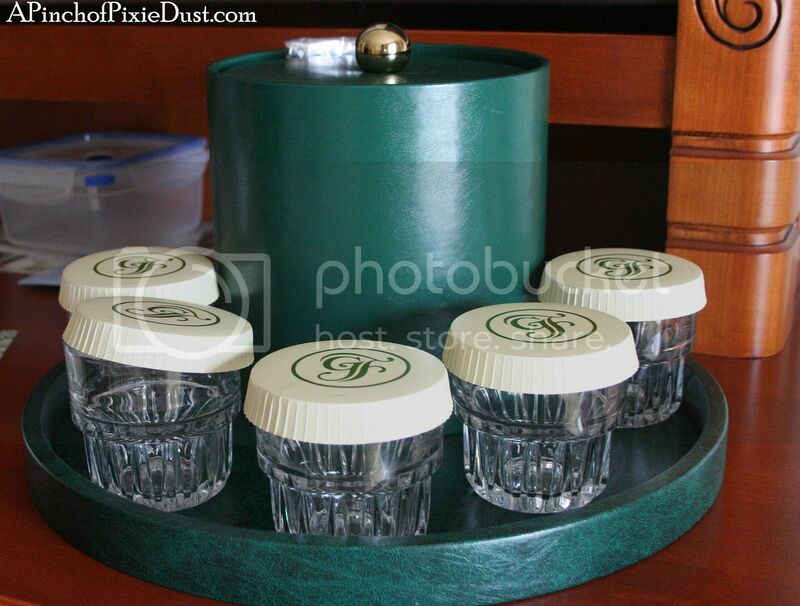 Here's what the tray and ice bucket used to look like...because I like to notice tiny details like that. ;) I think the Grand is the only Disney resort with customized "GF" paper lids for the drinking glasses...I'm glad they kept those! 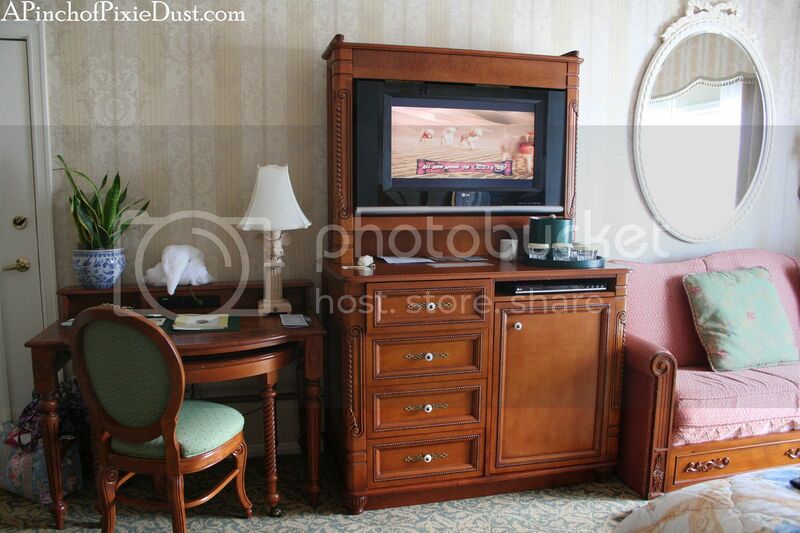 The desk / tv console / couch which stand opposite the bed...and the new version! 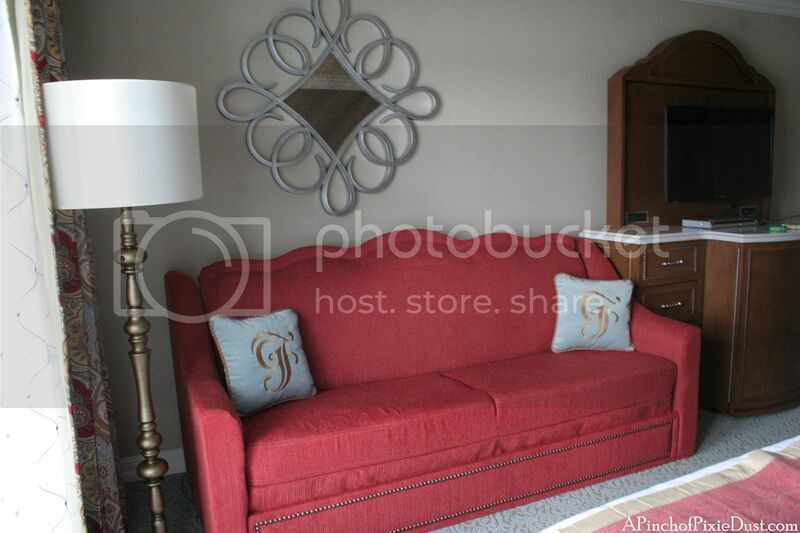 That big deep red couch definitely has flair, and the mirror is very funky. 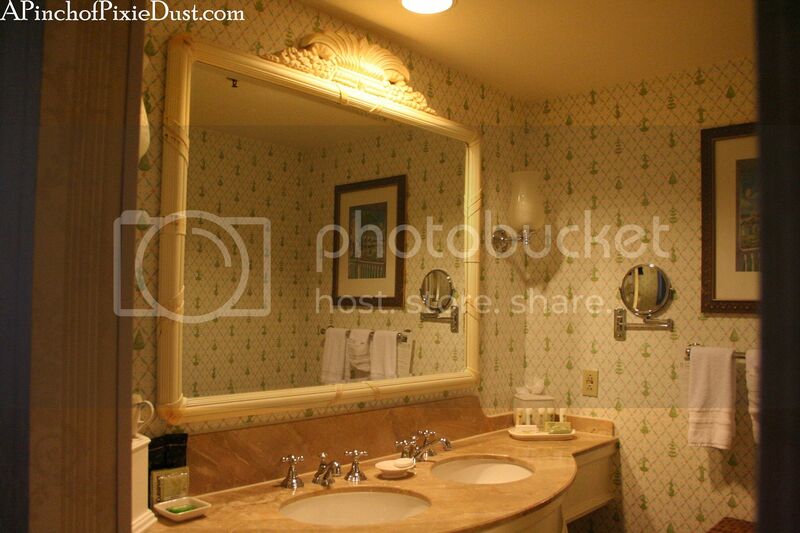 The new mirror has a dusty / speckly glass similar to that over the sink. 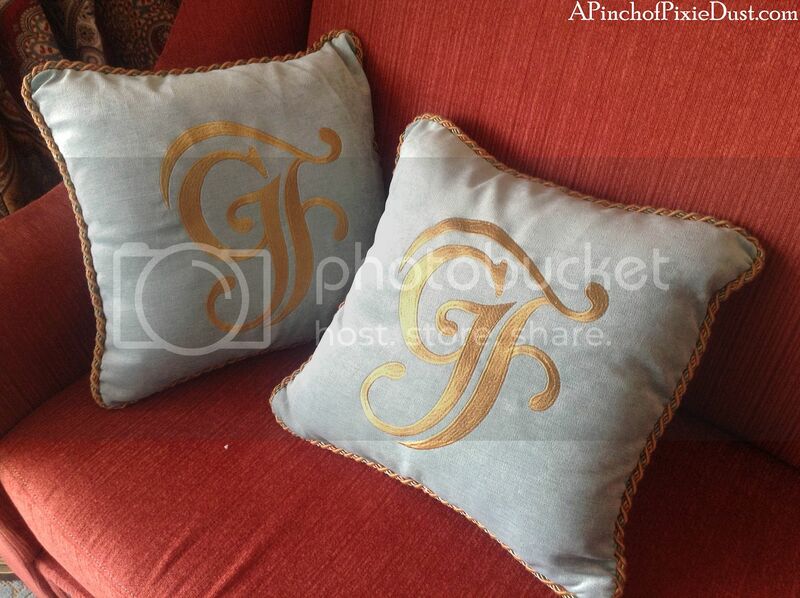 I highly approve of the new pillows - they've got the Grand Floridian logo stitched in gold! 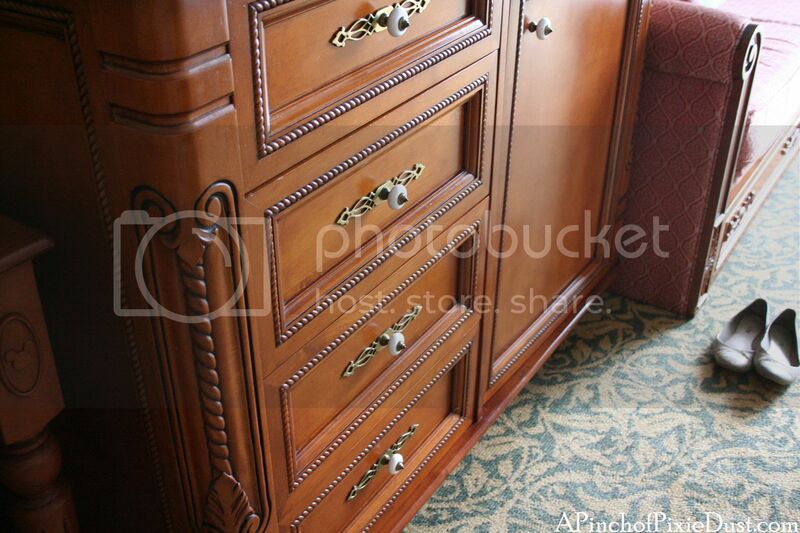 Old drawers on the left - new drawers on the right - both with pretty carved detailing! 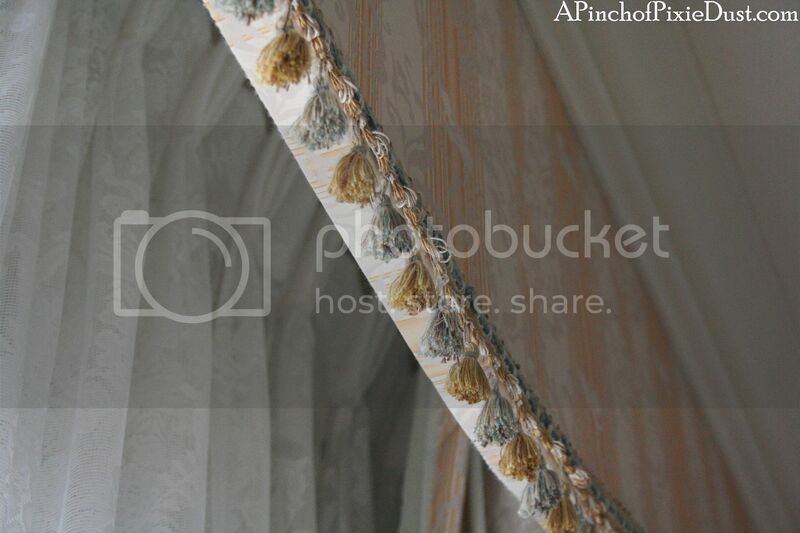 Shall we take a look at the curtains? 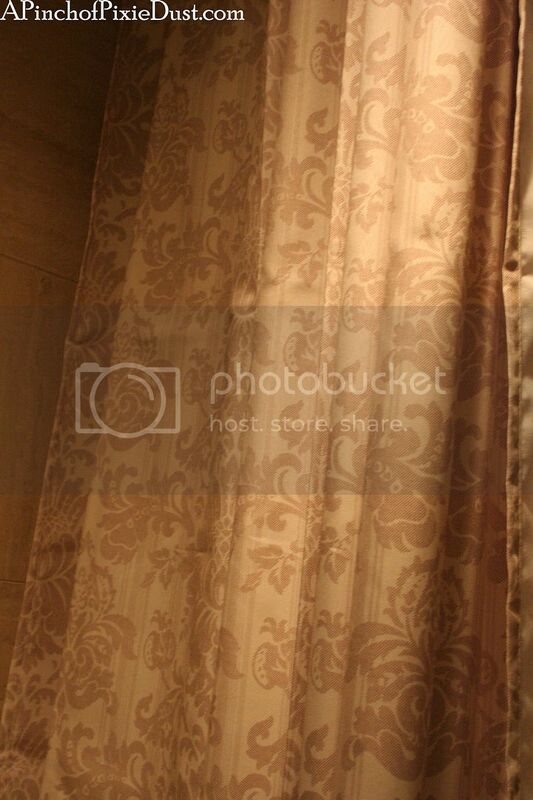 The old golden drapes looked like something from Buckingham Palace. 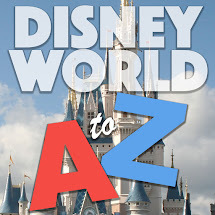 The new ones feature much more vivid colors and some hidden mickeys! 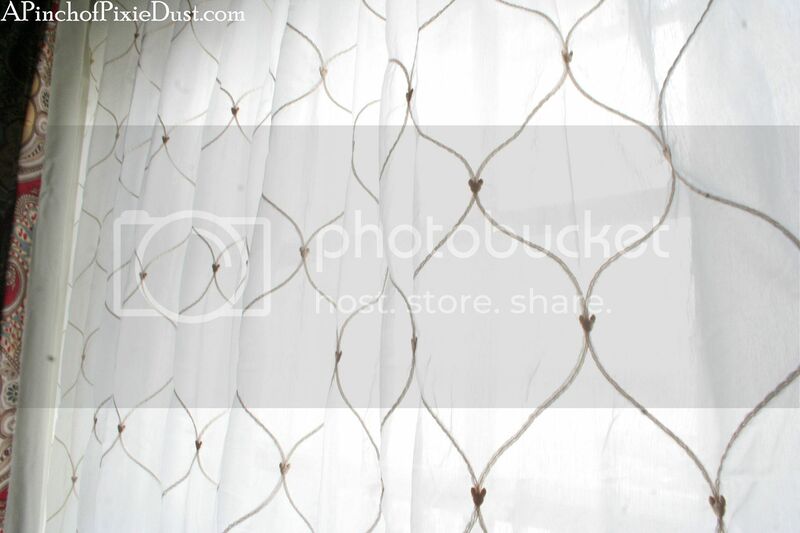 The new sheer white drapes also have some tiny golden mickey heads! Previously these were lace. Our room did not have a chair - I'm guessing this was because of the funky layout and not because they've gotten rid of the usual chair by the window. I really love this change - the texture is so interesting, and it feels and looks so luxurious! 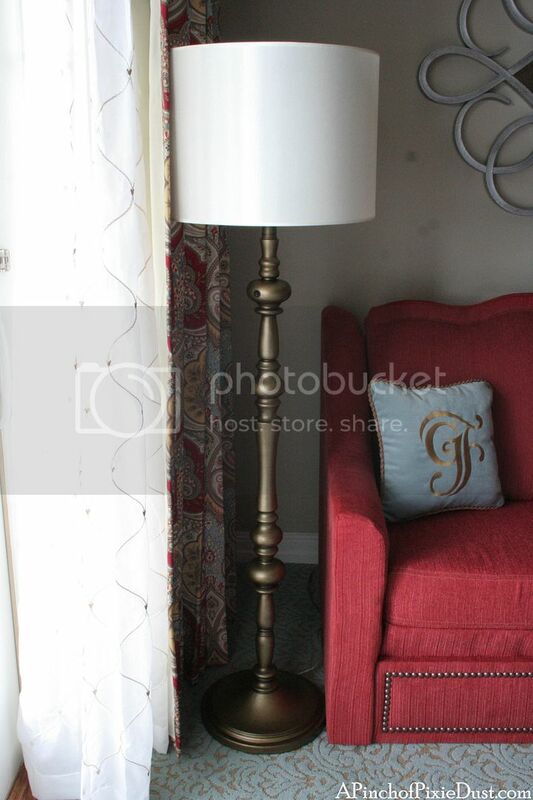 The floor lamp by the window used to be a twirly minty green affair with some delicate gold details and ribbon on the shade. 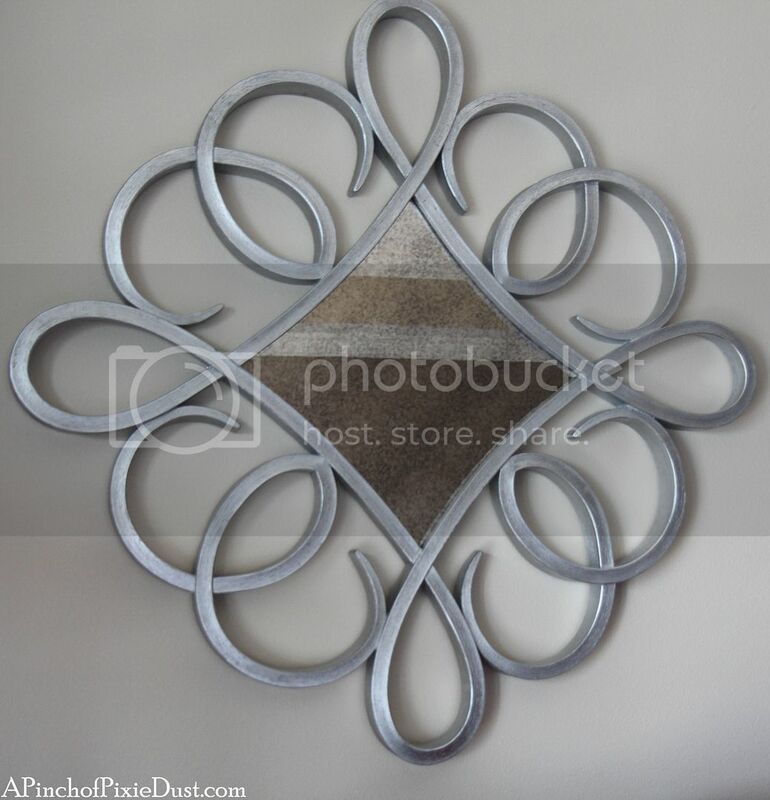 Now it's still sophisticated but not as soft - more metallic and streamlined. 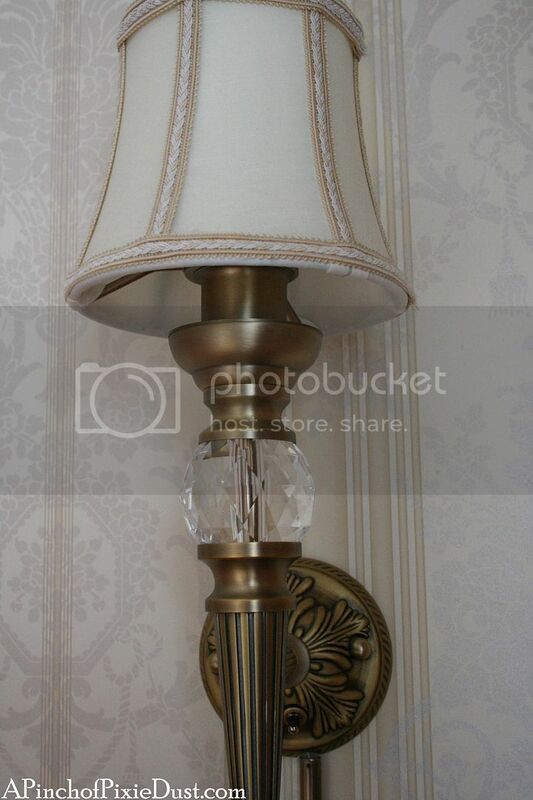 A study in Grand Floridian lighting! 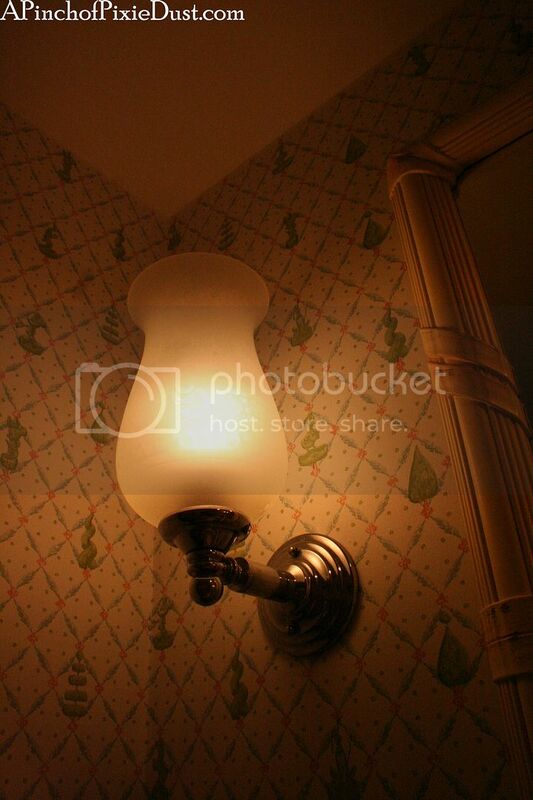 Far left we have the bathroom sconce from the old room (it's actually the same in the new room! 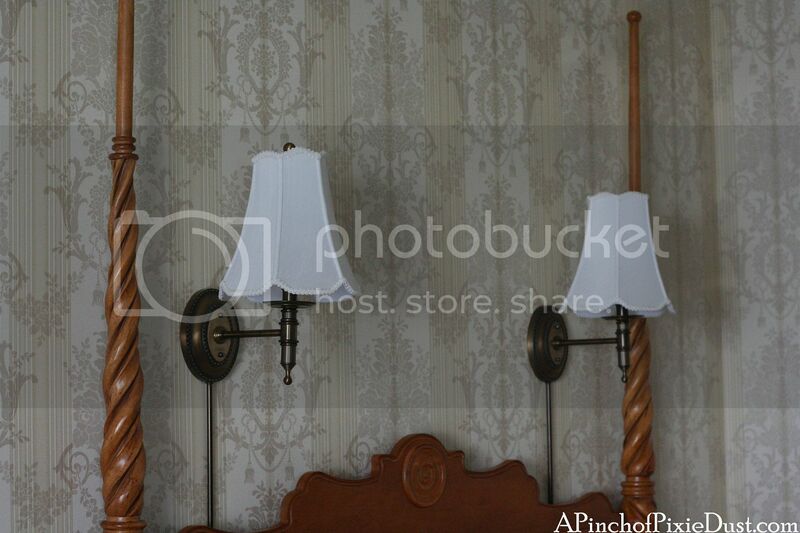 ); middle is a past wall sconce; far right is the present wall sconce. It had lost its orb - but a cast member came shortly after we checked in to fix it. There were a few little things it seemed like the contractors had missed, but then the renovations had only just been finished. 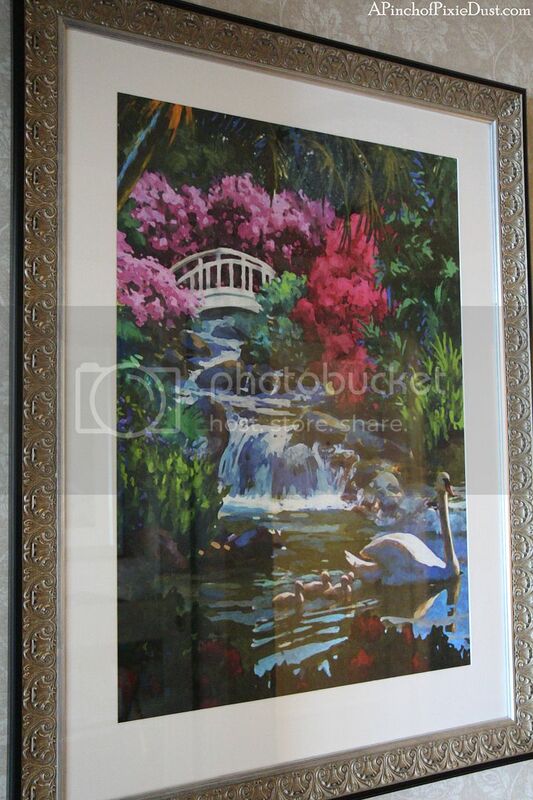 In the foyer area was this large painting of a swan and an oriental-looking garden. There was no art in the bedroom area, and it felt a little bare in consequence. 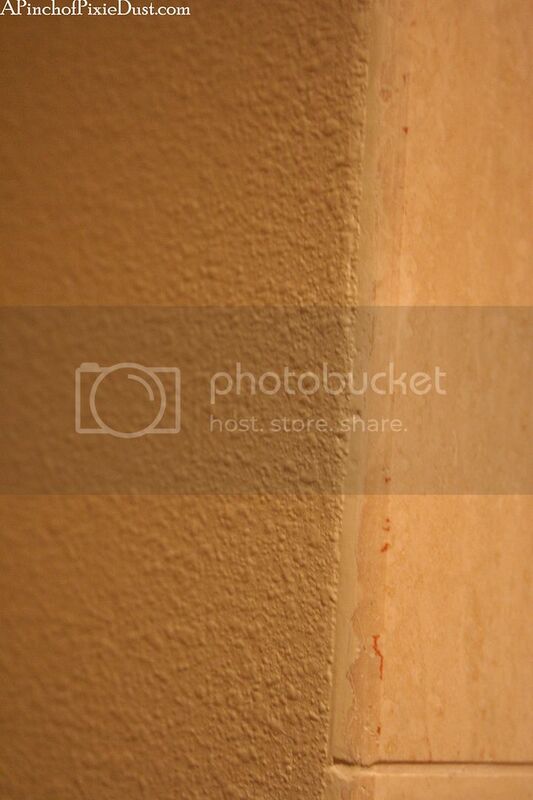 I was very sad to find the bookshelf painting gone. 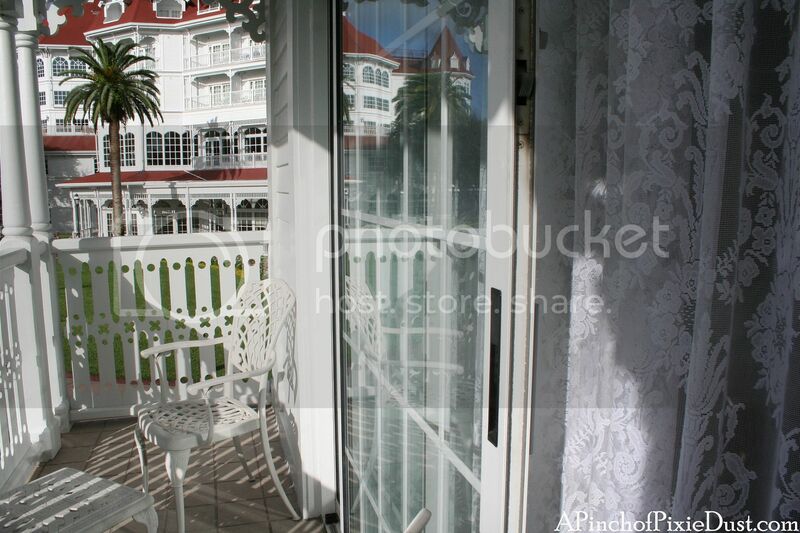 This was one of the most charming pieces of resort art on property. I'm not just saying that because it had Jane Austen books...but do you see Pride and Prejudice in the corner? It had Sense and Sensibility and Anne of Green Gables too. 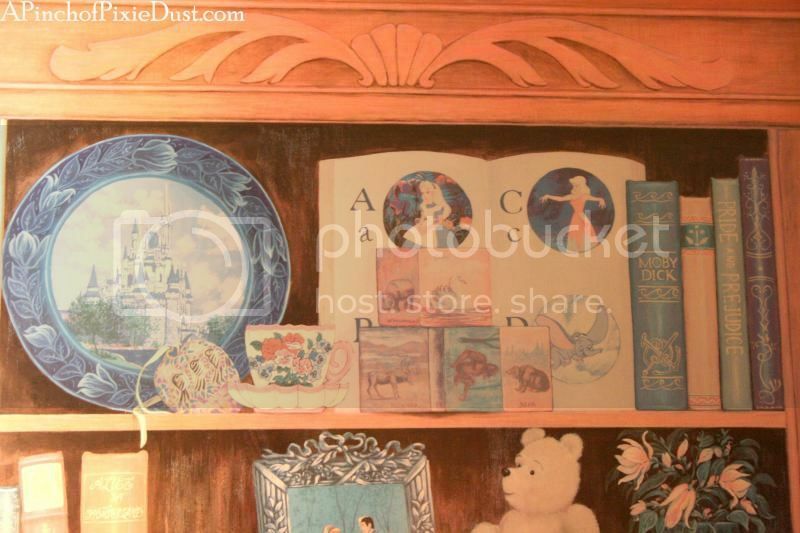 And the Winnie the Pooh plush and the Cinderella painting. Sniff. 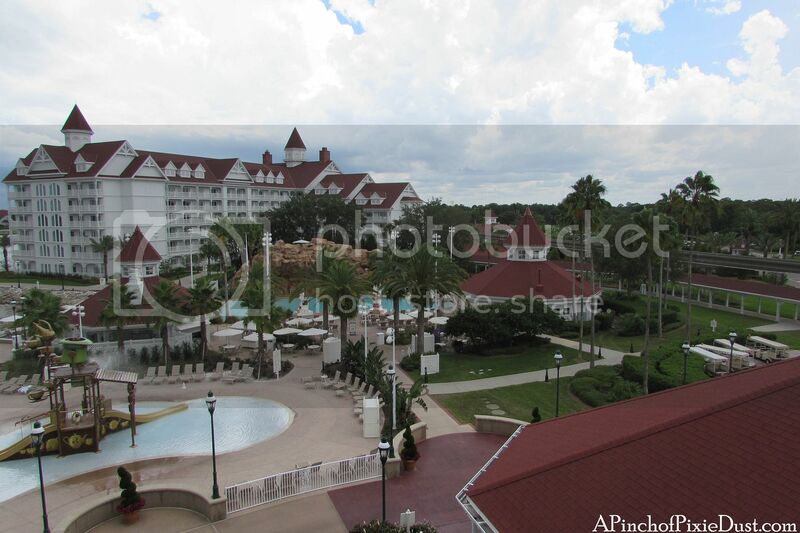 The new swan and garden are pretty, but they don't feel like they belong so perfectly to the Grand. 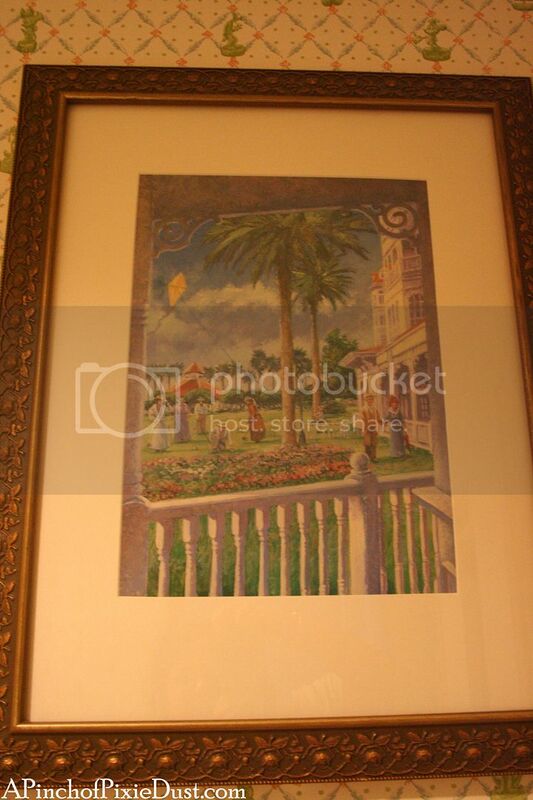 I wish they had done something more like the hallway art over at the Grand Villas. 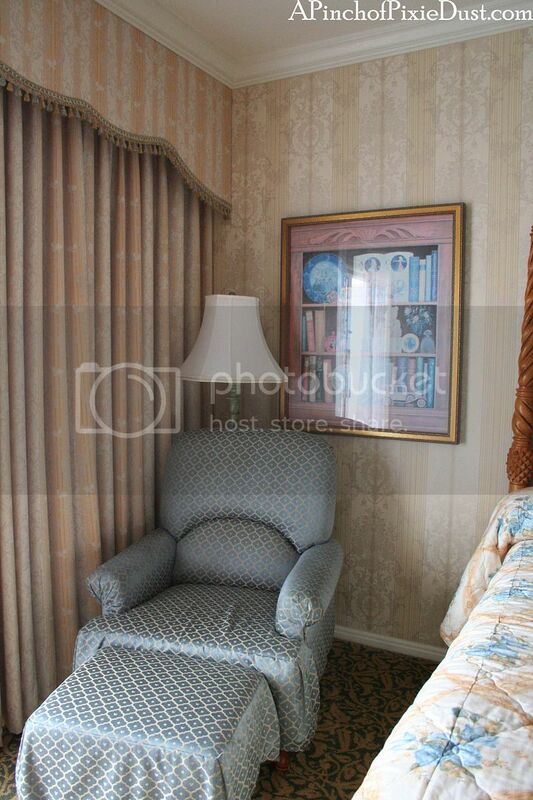 The painting was a disappointment, but the new Mickey chair was a home run! 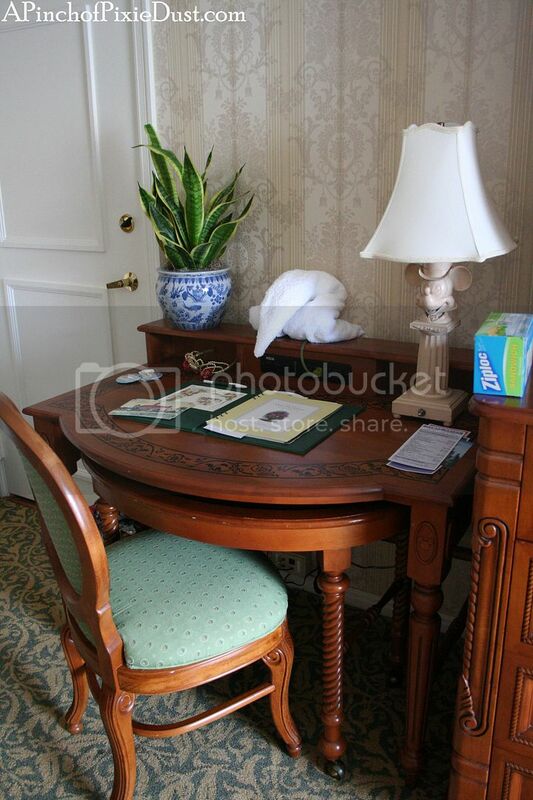 I do adore the new Mickey chair, and I like the dark wood and bright surface of the new desk too...but can someone tell me how the generic potted palm got to stay but the charming, incredibly dapper, top hatted Mickey lamp had to go? A few more shots of the new space - there's Alice in Wonderland art on the wall. Taking tea with the Mad Hatter! 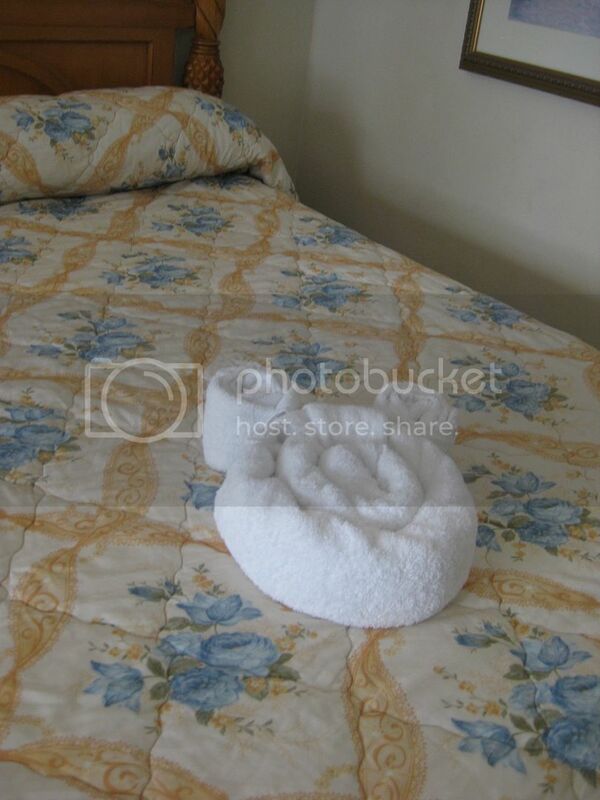 Ahhhh...the deluxe resorts have such lovely toiletries - and the Grand's selection is fanciest of all! 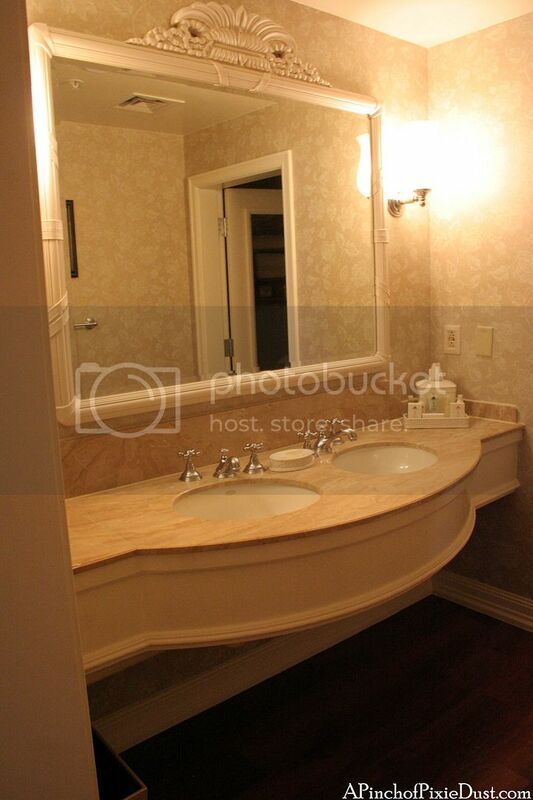 Some shots of the old sink area. 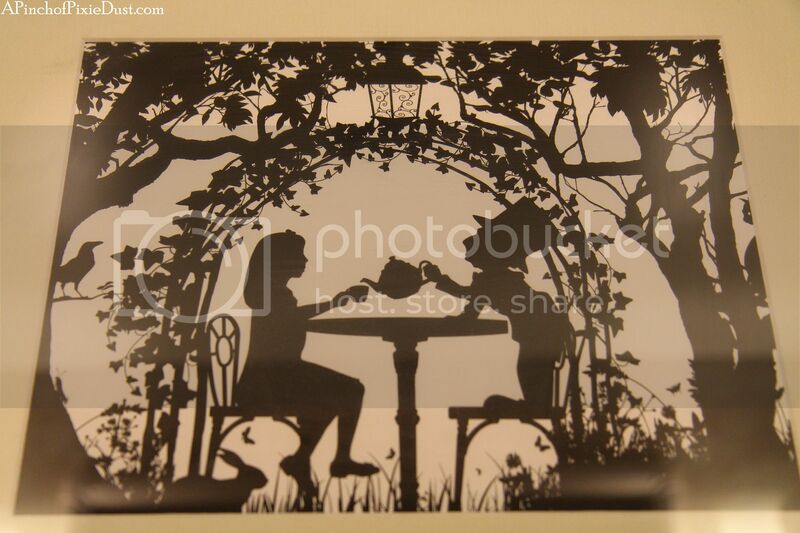 I do like Alice, but I miss that charming garden scene. 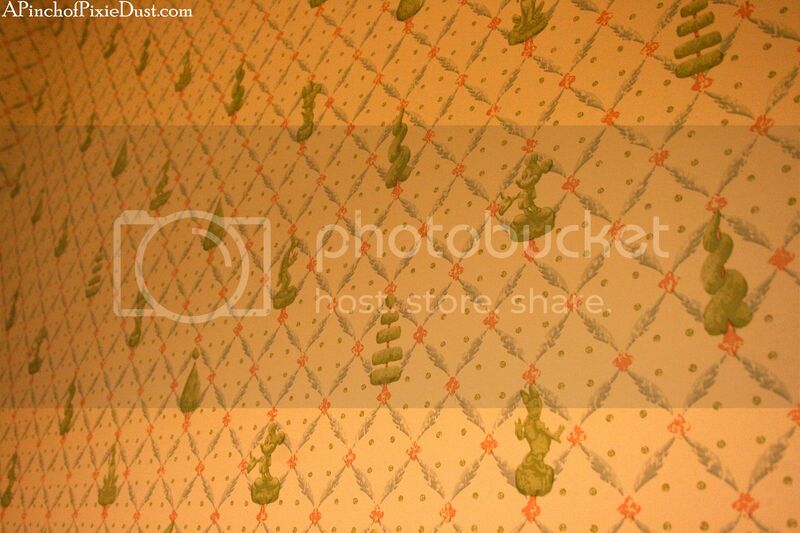 I wish they sold the old character topiary wallpaper by the roll somewhere...I want it for my own room! More comparison shots. 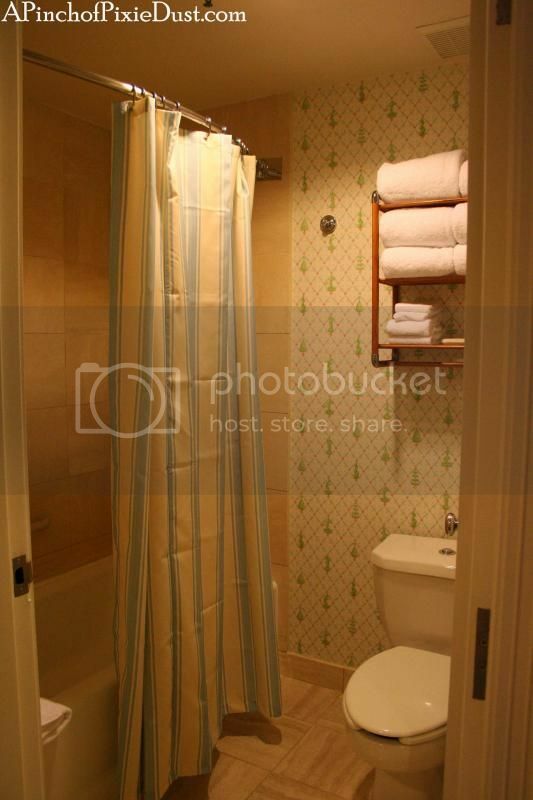 I'm not sure if all the new rooms have that short shower curtain or if that was just a mistake? 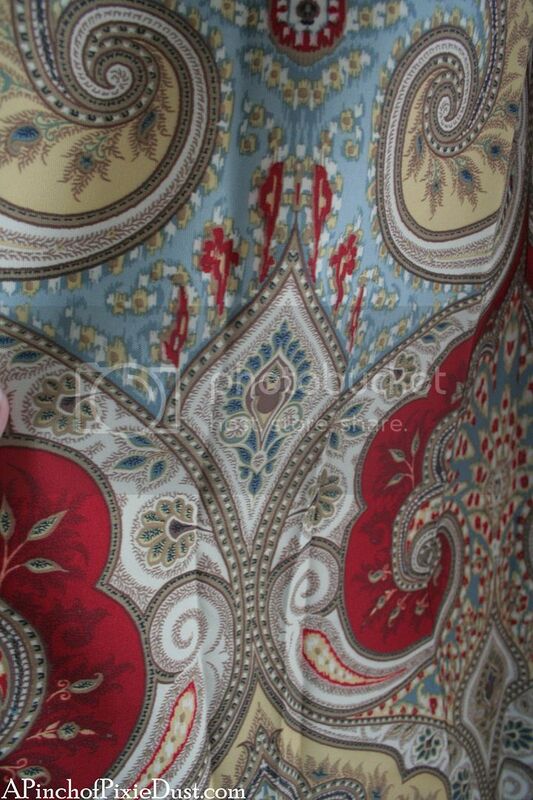 I did like the elegant new curtain print, although the plain beige walls were pretty boring. 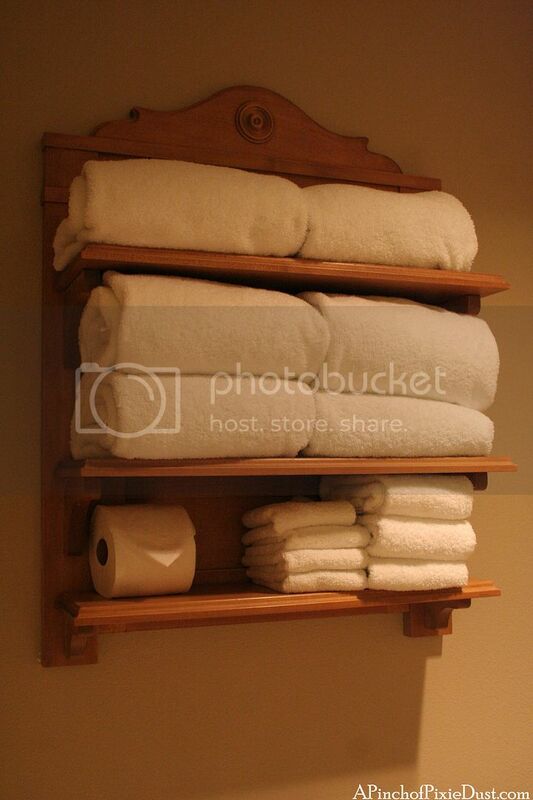 Old towel rack - new towel rack! 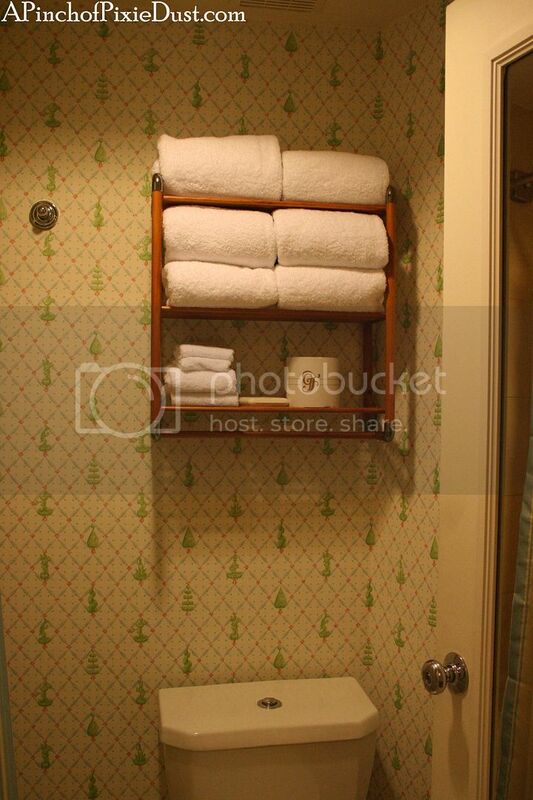 This is a really small, silly thing to notice - but the extra toilet paper roll used to have a very proper little wrapping with the Grand Floridian logo on it. I somehow enjoyed that. lol. I wonder if our bathroom was slated to get some more repair work done soon...some of the painting and grout work seemed less-than-finished. ...with just the same charming views! 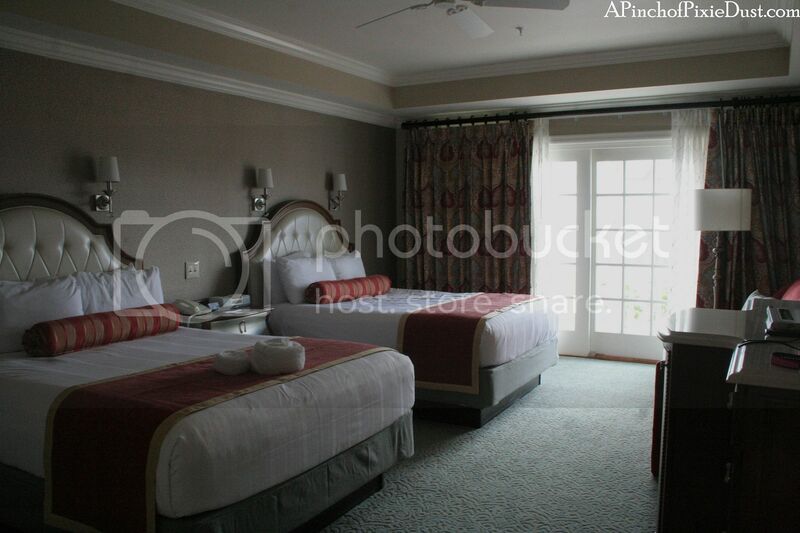 Our room this trip overlooked the Seven Seas Lagoon, the pool area and the Grand DVC building. There were elements I liked in the new room and elements I didn't. 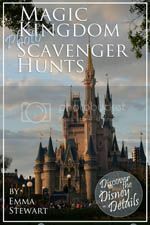 The Imagineers seemed to be going for a much more modern, sleeker design, and objectively I do like it...but I don't feel it fits with the Grand's theme as well as the old look. 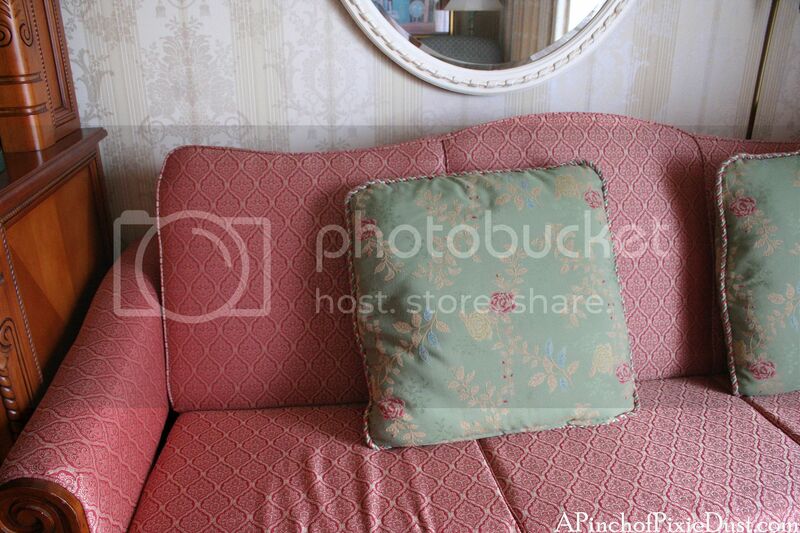 The old room made you feel like you were actually stepping back in time into some cozy and elegant Victorian mansion. 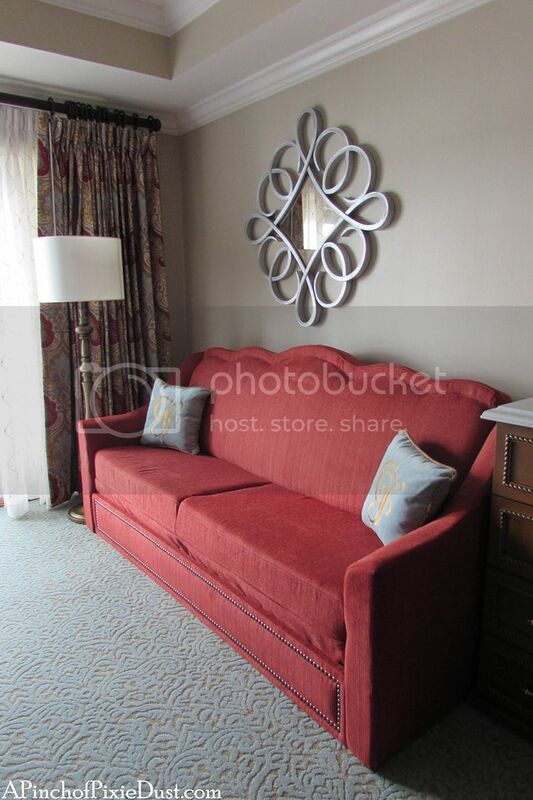 In some ways the new room feels more like it belongs at the Contemporary! 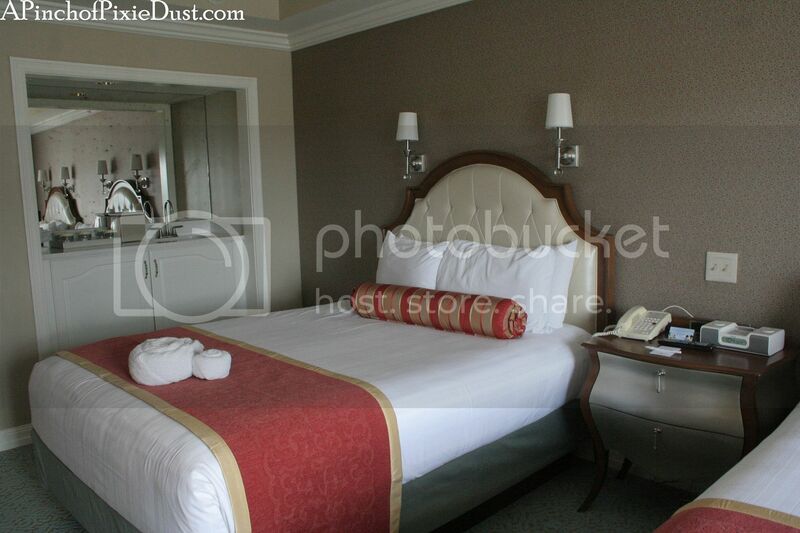 Be sure to share your thoughts on the Grand's room redesign in the comments! 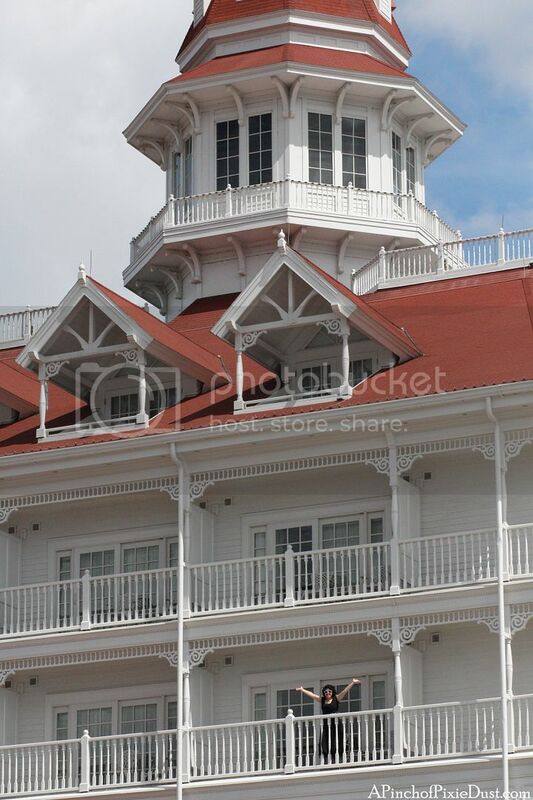 And stay tuned for more photos and videos of the Grand Floridian's new look in the lobby and the Royal Palm Club lounge. 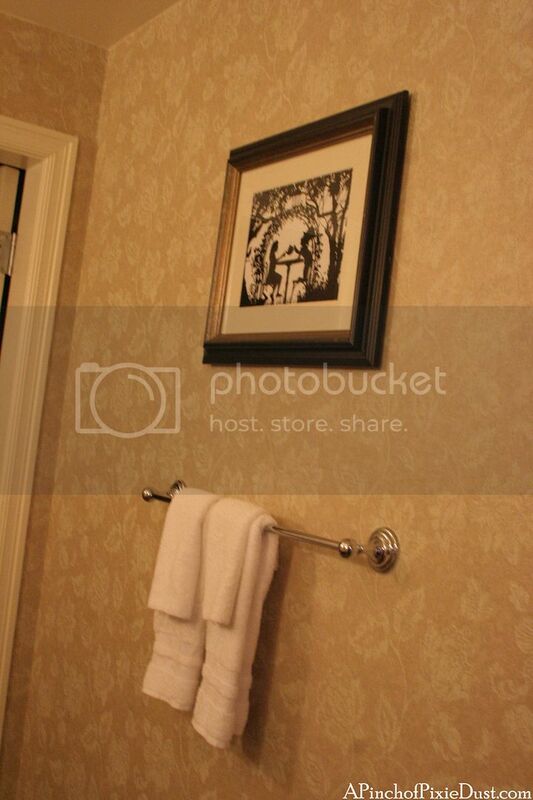 It's beautiful -- but I agree -- the decor looks as though it would be more suited to the Contemporary. I thought Victoriana was supposed to be the hallmark of the Grand? VERY cool comparison! This is great. I personally prefer the newer rooms, only because I felt the old rooms were getting a bit dated (as in, you could tell it was probably last renovated in the 90s). 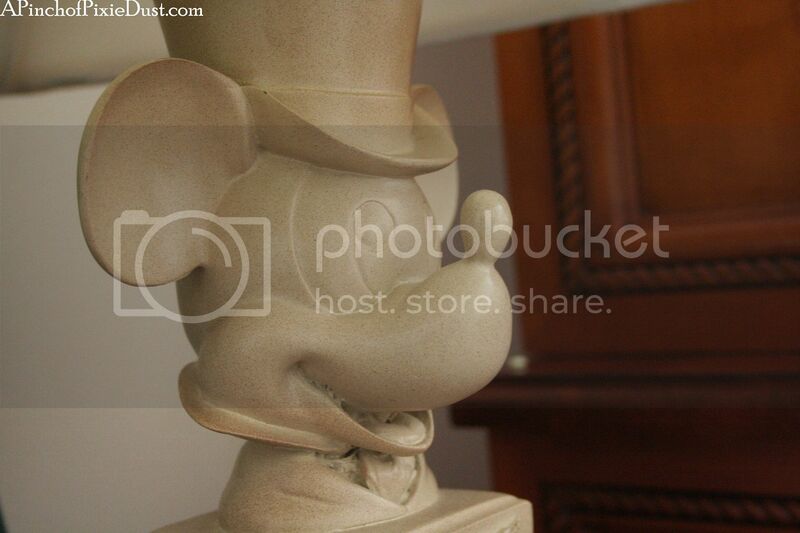 BUT, that being said, the older decor did have its own charm and I am with you on the Mickey with the top hat!! :) Thanks for this neat comparison! I am a sucker for before and after shots - love them! Thank you for posting. I like the changes, but I will miss pieces of the old as well. 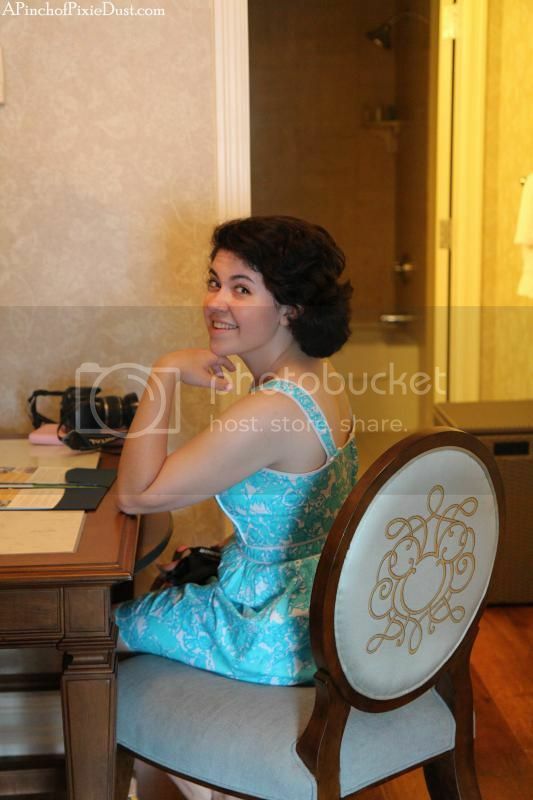 I liked that topiary wall paper too--it was so cute! 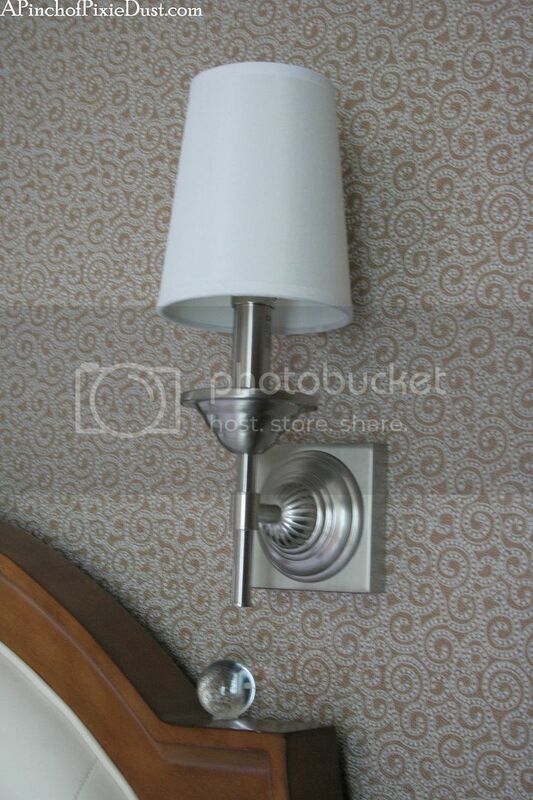 As was the Mickey lamp. 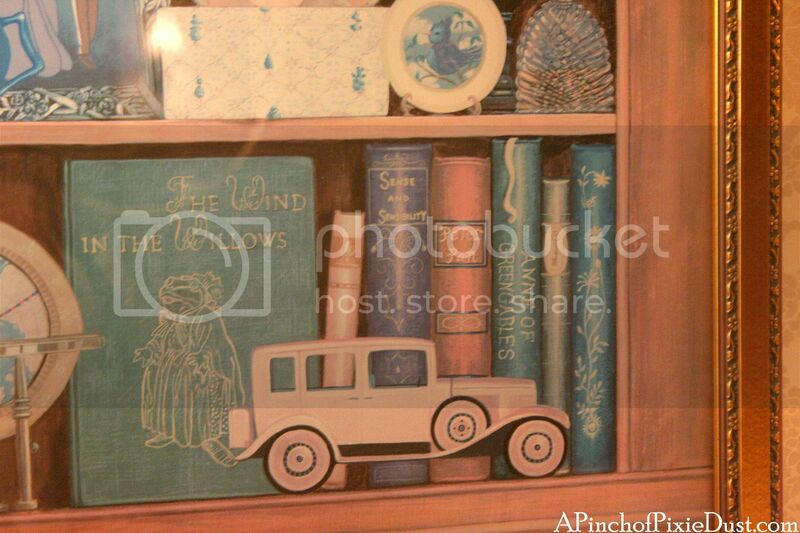 I too loved that Bookshelf painting, and am sad to see it is gone too. 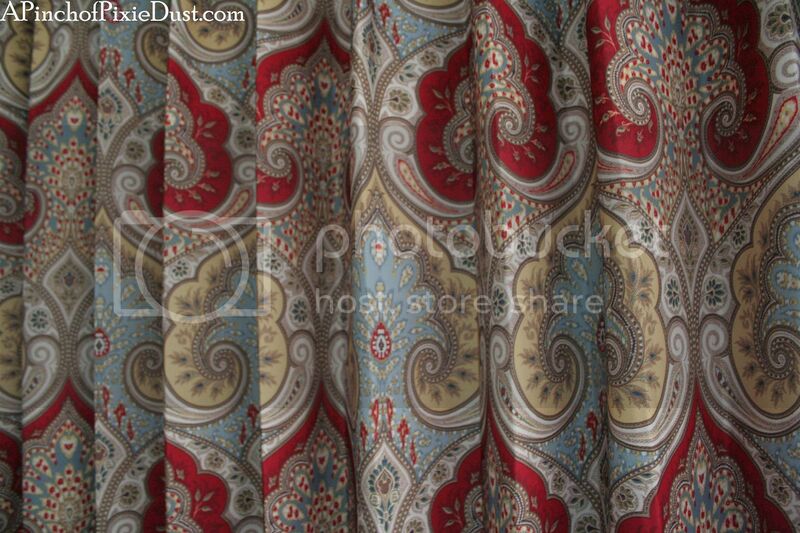 While I do adore the new sheers, I really think the curtains from the "old" room were more fitted to my mind's eye of the GF. I do like the new chair and couch. 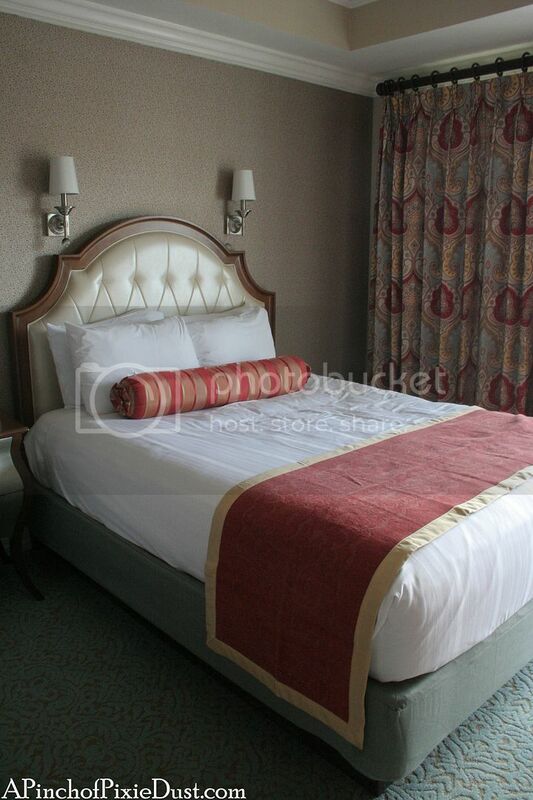 They seem more posh :) I'm in love with the new headboards and carpet! 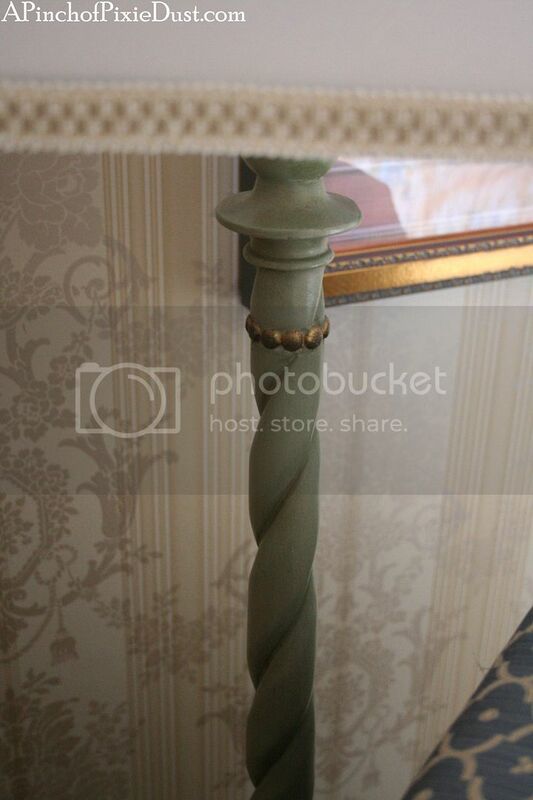 And the night stand, well it looks like it's right out of Beauty and the Beast. Perhaps a relative of Madame de la Grande Bouche? 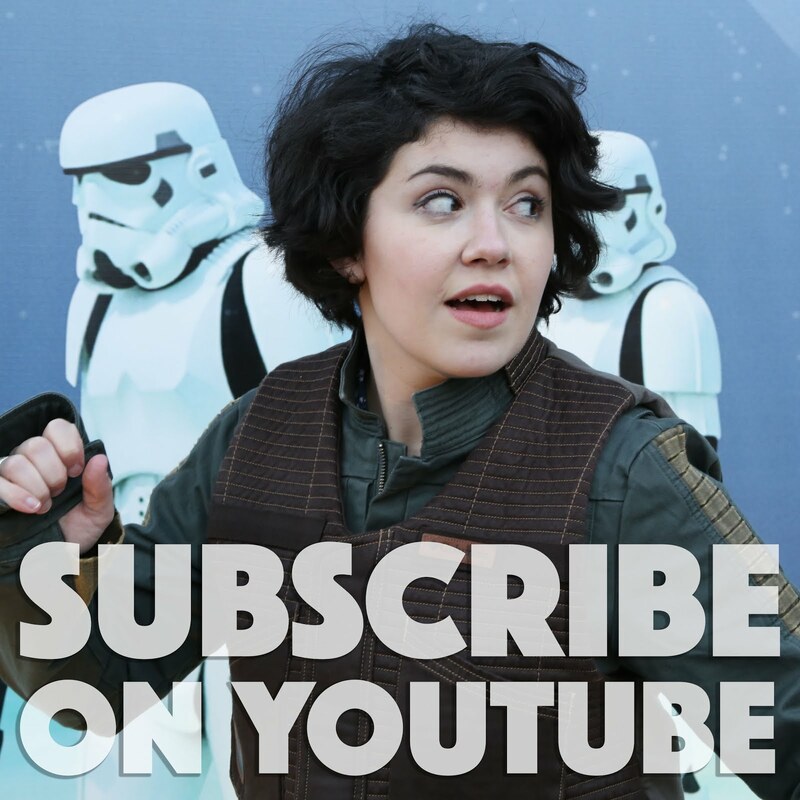 Thank you so much for the before and after and the video as well! 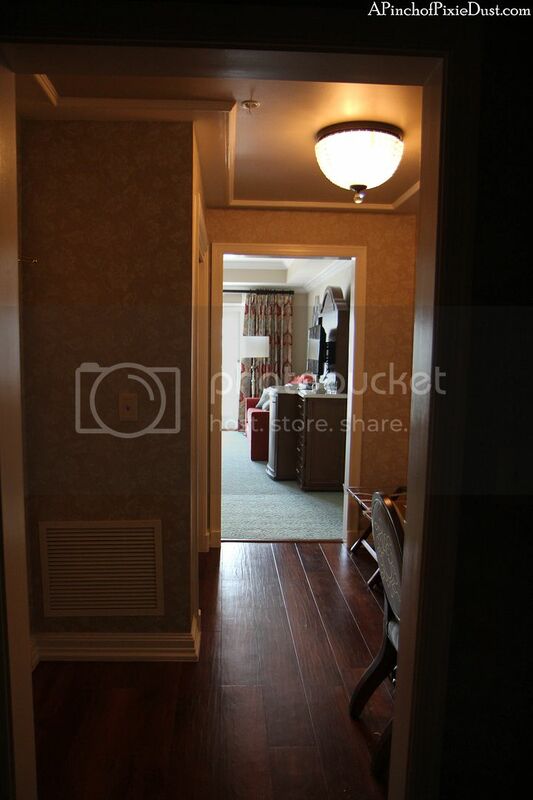 The renovations robbed the GF of their old-fashioned, Victorian charm, which is supposed to be the theme of the GF. 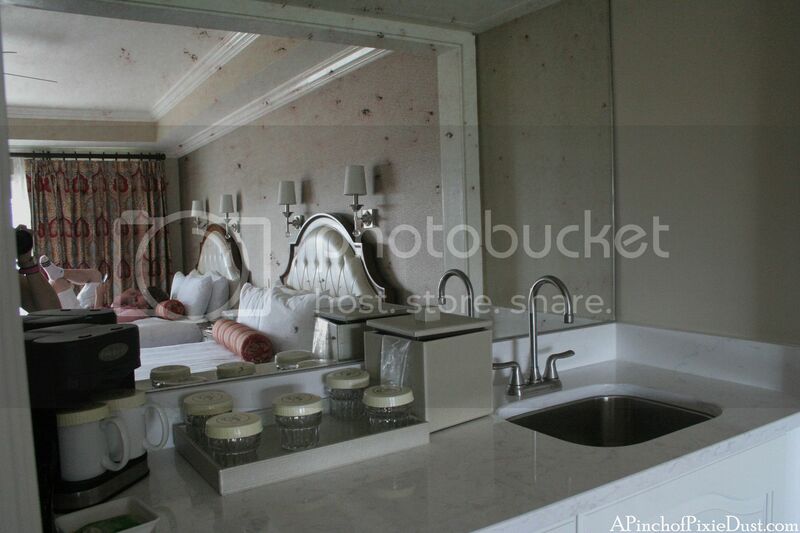 It seems the renovators thought they had to compete with the new Four Seasons on property, so tried to make the interiors look as beige and bland as a typical (boring) high-end hotel room. 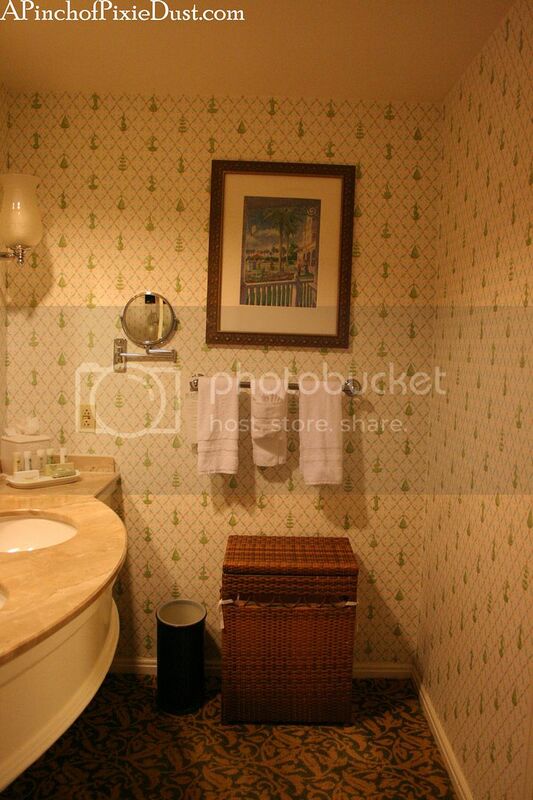 They succeeded in the beige and bland department, at least. Sad to see true charm and imagination ditched in an attempt to compete with a chain. 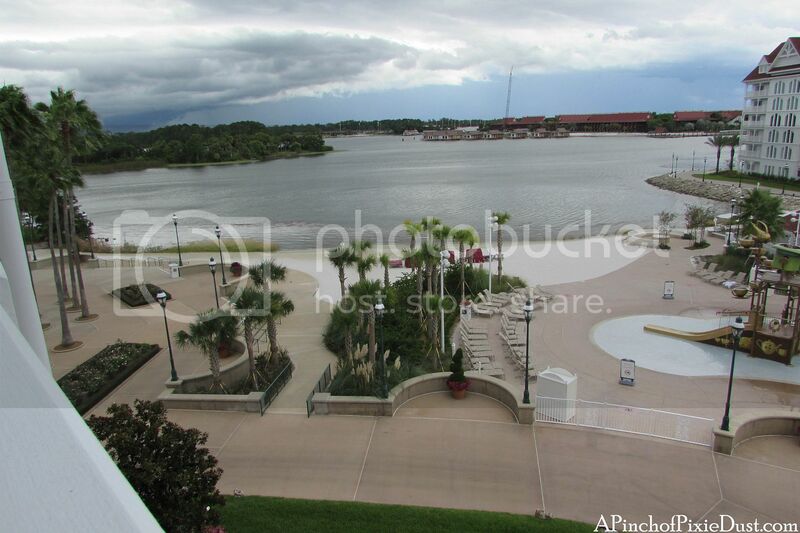 On my next visit I'll just stay at the Contemporary. 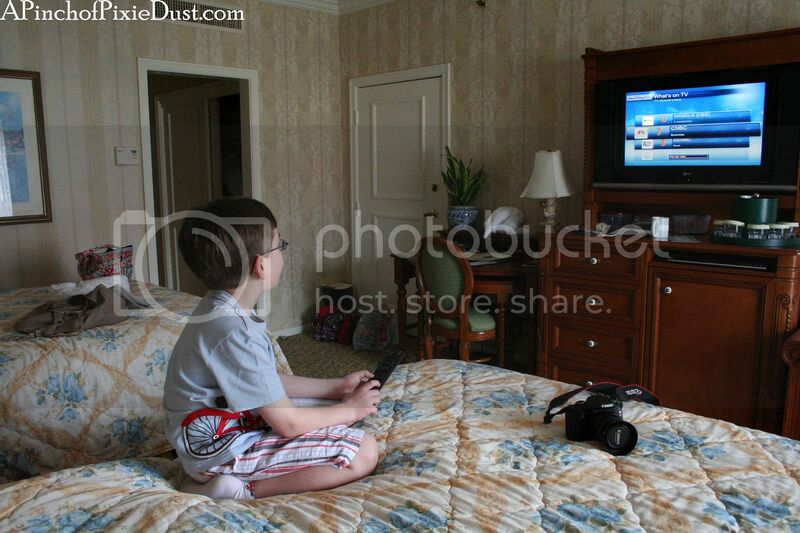 We just stayed the room right next to yours last week. It's fantastic. We will go back the same time next year.